REAL is honored to know Mary Ann Lederer and have her as a friend. Her story is an inspiration to all. She recently celebrated her 70th birthday and gave the speech below at a Vegan Earth event in Cincinnati last month. We like to share stories about REAL people making a difference in this world and Mary Ann is one of them. It hasn’t been easy for me to get to 70, so I’m celebrating. Thirty-five years ago I was shot in the back. I was 35 at the time, so this September will be a turning point when I will have spent half my life paralyzed. And this July I turned 70. So I’m celebrating. When I was shot 35 years ago, I had a near death experience, was in a coma and then woke up. I was soon asking myself some questions which I’m told are the questions most women ask when they have been severely injured. Who will care about me now? Who will love me? Who will be there for me when I need help? It was very scary the not knowing. But then I went through wonderful physical therapy and learned to take care of myself. And in spite of the horror of my situation, this has turned out to be an amazing – sometimes even miraculous – 35 years. The first five years in the wheelchair were actually fun for me– sort of an enjoyable athletic event. I learned to jump curbs and dance on my back wheels. I took up painting as a hobby. However, by the sixth year my health began to deteriorate. By the tenth year – that was twenty-five years ago – I could barely sneeze without breaking a rib. My hip broke, my leg broke, most of my ribs broke and my spine began to bend. I could barely sit up any more. Eventually breathing became difficult. I wrote a will and prepared to die. I consulted many medical doctors, but they could figure out nothing. I sought help whenever I could and finally pleaded for my life, shouted, screamed, begged, cried and prayed. Then miraculously I met Dr. Irene Barbasch, naturopath, osteopath and chiropractor, who taught me how to turn much of my health around. For many years Dr. Irene Barbasch was involved in the Natural Hygiene Movement. She was a friend of many of the great nutrition writers of the times such as Ann Wigmore, Paul Bragg, Paavo Airola, Bernard Jensen, and possibly Max Gerson. Her approach to health is now practiced at the Hippocrates Institute, Hallelujah Acres, and many more. She believed that her job as a doctor was to teach her patients how to be their own doctor. One of the first things she did (something all doctors ought to do) was to have me write down everything I ate. In fact she asked me to write down everything I put in my mouth, supplements, prescription and over the counter drugs, etc. And she had me write down how I felt periodically throughout each day. And she wanted a detailed description of bowel movements. Since the majority of health problems are probably caused by what people put in their mouths, those doctors who don’t ask about this will inevitably not find out what is actually wrong. These doctors may mask the symptoms with drugs causing further problems later on. Dr. Barbasch on the other hand spent a great deal of time searching for answers, although in my case she discovered many of the causes of my problems very quickly. Within 6 weeks to 6 months I was back out driving around resuming my life much as it had been. That was 25 years ago. For the next 20 years she taught me by phone (for hours every week) and by weekly visits. She taught me as much as she could to prepare me to take care of myself. She died 22 years from the day that we met. Once my health was stabilized I became involved with EarthSave Cincinnati, now called VeganEarth. Part of my purpose was to learn about all the things I didn’t know — about animals, environment and health. But part of my purpose was to share with people what I had learned from Dr. Barbasch. I have been involved in planning over 140 programs with potlucks over the last 12 years. Principle #2: According to Dr. Barbasch all illness is toxicity or deficiency or both. The Standard American Diet – SAD – is poison. It’s both toxic and deficient. There is no avoiding health disasters if you eat this way. And unfortunately when most people get sick, instead of discarding the Standard American Diet, they go to doctors and get toxic drugs which add toxicity to an already toxic situation. You can’t solve toxicity with more toxicity. The drugs suppress symptoms only temporarily and then more health problems are inevitable. Instead of drugs, upgrade your diet. Principle #3: Dr. Barbasch categorized health problems as acute and chronic. Acute problems include about anything that is discharging toxins, such as colds, fevers, diarrhea, vomiting, etc. She called these ‘healing crises.’ I remember the first time I got a high fever, over 102 degrees. She was so happy. “Children get high fevers. Shows vitality,” she said. It was a good sign. According to Dr. Barbasch, the medical field specializes in using drugs to suppress acute problems or healing crises, and this causes the problems to become chronic. Cancer, heart disease, stroke, diabetes, autoimmune diseases, allergies, etc. would fall under chronic problems. Principle #4: Eat whole foods. Principle #5: Eat as organic as possible. Principle #6: Eat mostly raw foods. Raw foods are cleansing, cooked foods are building but raw are building too. Because of the amount of illness in our society from toxic, filthy food, eating the most cleansing diet possible seems to me a real good idea. Raw foods have more oxygen. Cancer cannot live in oxygen. The Standard American Diet is causing terrible oxygen deficiencies. Also raw foods have more water, which is good for cleansing. Raw foodists will tell you that cooking kills enzymes, an important point to consider. If you want to feel as alive as possible, eat living foods. Principle #7: Fasting is Nature’s great cleanser. Cats do it. Dogs do it. Animals don’t eat when they’re sick. We can learn a lot from them. Fasting gives the body a chance to rest. Every time I experienced a healing crisis – fevers, colds, etc. – Dr. Barbasch put me on a fast. That made good use of the healing crises. It always worked. I always got better and was much improved for having fasted. Dr. Barbasch considered fasting to be scientific. You need to study it. If you’re real toxic, a water only fast will be too much for you. When you drink only water, the toxins in your body go into the blood stream and out the kidneys. This can be very dangerous if you don’t know what you’re doing. There are places around the country where people pay a lot of money to be fasted. If you do it right, it works and you get healthier than ever. Principle #8: Juicing. You can supplement your meals with powerful fresh juices. Or you can use juicing as a milder fast. If you want a milder fast, a slower cleansing, stop eating and drink fresh raw juices. Bottled juices are not any healthier than any other processed corporate concoctions. Principle #9: Sprouting is a simple easy way to grow living foods indoors all year long. Principle #10: Drink lots of water. Principle #11: Chew your food a lot. Principle #12: Edible wild foods are a powerful and free source of nutrients. Finally, there is a raging debate about whether to be vegan for health or vegan for animals. Here is my position. I think we should be vegan for animals. The unprecedented cruelty against animals necessitates it. However, people also need to eat for health. Eating animals is toxic to human health, but eliminating animal foods from the diet while continuing to eat poisonous, unhealthy highly processed vegetables and fruits just doesn’t make sense. Eventually it will take the joy out of life. If you’re afraid that your health will decline if you give up animal products, then simply upgrade your diet. All of us can periodically upgrade our diets. None of us are perfect. Just follow Dr. Barbasch’s principles. Now nobody here today is an unkind person. None of us would deliberately inflict hideous suffering and cruelty on any being whether human or not human. The cruelty of the worst kings, queens and tsars of history as well as all the psychopathic murderers pales in comparison to the suffering our animal industry creates. Watch the undercover videos taken by Mercy for Animals. These are the rule, not the exception. And please don’t say, “I can’t watch that,” and then continue on your merry way. If you’re eating animals, you’re endorsing an industry which is psychopathic. And you’re participating in psychopathic cruelty. Come on. We’re all too decent to behave like that. There isn’t enough room on the planet to raise animals humanely and feed the numbers of people who think they need to eat them. If there were such a thing as truly humane animal agriculture, then we would need a class system just to decide who qualifies to eat them. What we do need badly is a critical mass of vegans. In all other progressive social movements, once a critical mass of people has made the shift, change accelerates with increasing velocity. It is my dream that we get to this point as quickly as possible and cease to cause such suffering to animals. Many people have helped me get to age 70. In fact before I became a paraplegic 35 years ago, I had no idea how helpful people can be. Now I live in a state of gratitude and awe for those who jump out and help others when they are needed. Many of those who helped me did it as though it were a privilege for them. To those people I am deeply grateful. And to those who helped me, I thank you for providing me with the most important of life saving emotions. You have given me gratitude and awe. 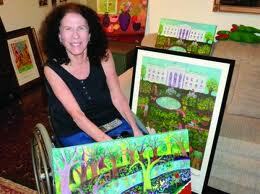 More about MaryAnn and her art can be found at www.maryannpaintings.com. This woman has been an inspiration to our community for decades. Her commitment to taking responsibility for her health is amazing. We also appreciate her unbending, passionate activism for all sentient beings, and a responsible vegan lifestyle. Amen to that! Thanks for the post, John.